Chairmans Reserve Spiced Rum is a popular Rum available from DrinkSupermarket.com in 70cl to buy online. Visit DrinkSupermarket.com for the best price for 70cl of Chairmans Reserve Spiced Rum or compare prices on our other Rum products. Deep mahogany colour with reddish tinges that offers a beautifully complex aroma of bitter orange, nutmeg, cinnamon and honeyed raisin. A sweet mouth feel with exotic spice - nutmeg, vanilla, clove and hint of exhilarating lime and orange peel. Best enjoyed over the rocks with ginger beer or cranberry juice. 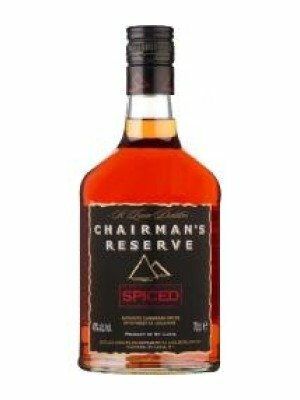 Where to buy Chairmans Reserve Spiced Rum ? Chairmans Reserve Spiced Rum Supermarkets & Stockists. You can buy Chairmans Reserve Spiced Rum online in most retailers and find it in the Rum aisle in supermarkets but we found the best deals online for Chairmans Reserve Spiced Rum in DrinkSupermarket.com, 31dover.com, TheDrinkShop, and others. Compare the current price of Chairmans Reserve Spiced Rum in 70cl size in the table of offers below. Simply click on the button to order Chairmans Reserve Spiced Rum online now.